When you don't feel like doing gongyo or daimoku, get on the green train in Tokyo that circles downtown I. and look out for the "Sunshine Building" near K--- station. This was built by someone who did not skip gongyo and daimoku for 30 years. Once there was man who was so completely down and out that he had made up his mind to commit suicide. He was in debt to his ears, his wife was blind, and his child had problems. But before he died, he wanted to have one last meal of his favorite dish — a vegetable stew called "oden." As he was walking around town in the evening shadows looking for a stew shop, he noticed a warm, gentle glow of lanterns coming from a place tucked in a corner. There were a number of people milling about. "Ah, a stew shop!" he delightedly mused. He walked briskly toward the light. As he entered and made his way through the small crowd, he realized he had made a mistake. It was a lecture. When he asked a person nearby, he was told that the speaker was a Mr. Toda. After listening, the man demanded of Mr. Toda, "If this Nam Myoho-renge-kyo is so powerful, will my financial problems be resolved?! Will my wife see?! Will my child's problems be resolved?!" To this, Mr. Toda replied: "Don't be ridiculous! If all it did were petty things like that, I wouldn't be doing this! Your financial problems will be resolved! Your wife will be able to see! And your child's problems will be resolved! Not only that, you will become a wealthy man! You will build a building that even looks down on airplanes! Do morning and evening gongyo and chant daimoku every day." Not because the man believed any of it, but because he was moved by the powerful conviction Mr. Toda had, he began to practice. Although it was difficult at first, he faithfully followed President Toda's instructions. He did not skip gongyo. He did morning and evening gongyo and chanted one and a half hour of daimoku every day. Sure enough, results began to happen. His financial problems were solved. His wife was no longer blind. His child no longer had such problems. The man even became vice president of a board in his company even though he was not well-educated like most of his peers. He became wealthy. His child became active in the youth division. Things exceeded his expectations. At the mark of practicing 30 years, he was seen standing on the top of a building, mumbling through tears. The man was standing on the top of a skyscraper that he had built. "It all became true! This building even looks down on airplanes! After 30 years ... Thank you Sensei, thank you Soka Gakkai!" It wasn't many years later that the man passed away in his 80's, leaving a legacy of consistent practice. 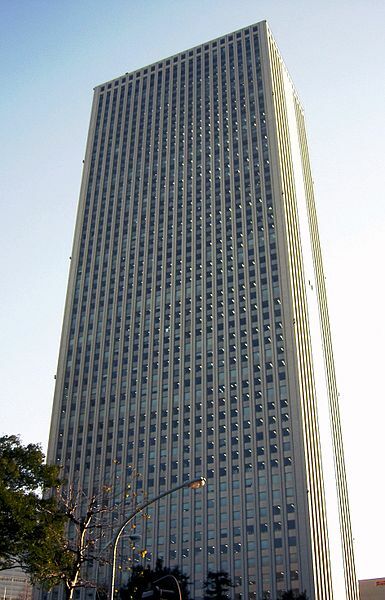 But before he did, he often pointed to the skyscraper and said, "This shows the power of daimoku! I am here to say it. So please, do morning and evening gongyo and chant daimoku." So when you don't feel like doing gongyo or chanting daimoku, take a look at the "Sunshine Building." It's still there. I love this experience sooo much! It has encouraged me even more to pursue any and all the big dreams I have! Through this story I now understand the meaning of the Buddha's mind vs. the min of living beings or che common mortal. When president Toda told the man all the things he could achieve that would have seem impossible to the mind of a common mortal, Josei Toda was speaking with the mind of a Buddha. Then when the man overcame all his ordeals and even built the tallest building in Japan then, he acted from the mind frame of a Buddha, one that, like the Gohonzon, has no limits. He built the building not out of arrogance or greed, but from the state of Buddhahood and the Buddha's mind that says: "It's not only possible, but it's specially possible because is for the sake of kosen rufu!!" Hi, lovely experience, but I can't share it till I can attach the source, like maybe NHR 2 Chapter 3 etc... So could you please share the source. Thank you!